If you have done any stand-up paddle boarding (SUP) while on vacation or with friends who are paddle boarders, then you might be interested in getting yourself a new standup paddle board. 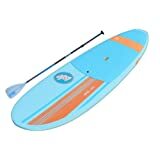 Paddle boarding beginners can easily get overwhelmed when shopping for a good SUP because there is a lot involved in choosing a good stand up paddle board. Some of the features that you need to consider are the board’s size, weight, capacity, and volume. 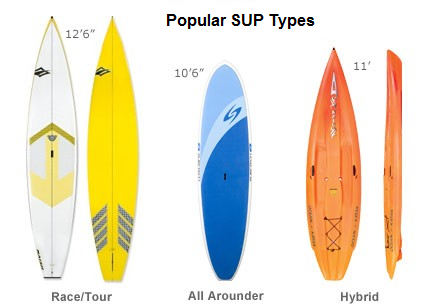 Before heading out to purchase your new SUP, first familiarize yourself with the different types of SUPs that are available for you to choose from when selecting a new paddle board. Inflatable vs Rigid Paddle Boards – Which Is Better? What The Best Stand Up Paddle Board Length To Choose? What Are SUPs Made From? How Much Do Stand Up Paddle Boards Cost? When you start looking at SUPs, you will notice that they are available in two main style types, as well as in two different design types. Note that while these are the two main types, they are not the only types of SUPs. To help you determine which type is best for you, let’s look at all your options. SUPs for kids: Got a little one who wants to go out paddleboarding with you? There are several different types of kid’s SUPs available for the rugrats. An 8’ long all-arounder is a good short board for kids who want to paddle on their own. This size board is a little easier for children to carry and maneuver. Of course, an inflatable SUP is another good option for kids since they offer a little cushioning for falls and are incredibly lightweight. SUPs for women: Since stand up paddle boards can be a bit on the heavy side, especially when trying to lift one above your head to secure to the rack on top of your vehicle, manufacturers offer some options for women that are lighter. Teens and adults who want a lighter board can also use this type of standup paddleboard. If you check out any of these ultra-light SUPs, then you will notice that some of them feature a narrow mid-section. This feature is designed to make it easier to reach both the deck handle and opposite side of the board. The people over at StandUpPaddlingTV give a great summary of this section in the video below. Give it a watch before continuing reading to learn more about how to choose the best SUP. If you’ve decided that you want to take up stand up paddle boarding, then you first need to determine if you want to go with a traditional rigid SUP or an inflatable SUP. Each has their benefits and disadvantages, which makes the choice entirely a personal one. Though I am a big fan of iSUPs (see my favorite 10-ft iSUPs here), I want to share some of the advantages and disadvantages of each type of stand up paddle board. The easiest way to do this is to go through a few different topics. How will you store your board? When it comes to storage, nothing beats the iSUP since you just deflate it, roll it up and slip it into the carrying back. You can easily put this in a closet or a car trunk without taking up a lot space. If you have a hard board SUP, then you need a rack to store it on in your garage. This can be a problem if you live in a small apartment or condo. How will you transport your paddle board? 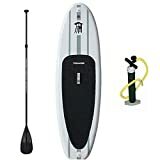 Like storage, when it comes to portability it is hard to be the inflatable stand up paddle board because it will easily fit in even the smallest of cars. But if you have a traditional board, then you need to be prepared to transport it on a roof rack on your vehicle. And of course, it won’t be possible with all vehicles, so that is something to keep in mind. What type of water will you be out in? Generally speaking, you get a bit more stability from a traditional hard stand up paddle board than an inflatable one, however that is not always a good thing. For instance, if you’re taking it out into some rapids then you will benefit from the give that an inflatable stand up paddle board offers. Basically, you need to go with the SUP board type that reacts best for the type of water you’ll be using it in. When you’re primarily going to be in fast moving and shallow water, then an iSUP is the better option. For deeper water that isn’t moving as much, a traditional solid paddle board is the better option. This doesn’t mean that you have to use these board types in the listed water types, just that they perform better in those. And if you plan on being in different water environments, then stick with an iSUP as it is more versatile. 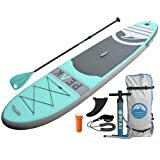 If you are buying based purely on cost, then you should stick with an inflatable stand up paddle board as they consistently offer the best value for the money. For the same specs, it will cost you more for a hard SUP than an inflatable one. Plus, the iSUP holds its value if you want to sell it secondhand at some point in the future. In the end, you need to select the board type that best meets your lifestyle. Use the info above to come to a conclusion on whether an iSUP or a standard hard SUP better meets your needs. 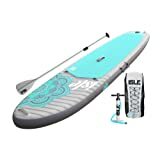 When you are looking for a new paddle board, you want to be sure that you are shopping for a SUP that gives you good stability so that you can easily maintain your balance out in the water. The single best way to know if you will get good stability from a board is the width of the stand up paddleboard. If you are new to stand up paddleboarding, then consider going with a larger SUP initially until you get comfortable balancing on it. Once you reach that point, trade up to a thinner, smaller board which will be more lightweight and offer better maneuverability. The thing with board length is that there is not really a one-size-fits-all approach to choosing the best length. The important thing is that you get a board with a length that is a good fit for your body size (mostly weight). The reason that this is such a big deal for beginning stand up paddleboarders is that you have to make sure that your board displaces the correct amount of water for your weight, or it will not support you in the water. If you end up needing a longer board, then you should know that they can be heavier and more difficult to carry when walking to the water (especially in wind) or trying to store in your home or on your vehicle. So, this is something that you might want to think about before you buy a new SUP. A 10′ to 12′ long board is a good option for paddleboarders who are just looking for a relaxing time out in the water or beginners to paddleboarding. A 12.6′ or 14′ long is good for people interested in racing or touring, or people who plan to travel for several miles on the SUP. A board of this length is faster than short boards. Get more maneuverability with shorter boards if you are an experienced surfer who knows how to handle a board out on the water. The construction materials of stand up paddleboards varies by brand and model. The most common makeup that you will see for a SUP is an EPS foam core wrapped with fiberglass, carbon fiber or plastic. SUPs can either be solid or hollow. For example, if you go with a more high-end paddle board, then it will probably be hollow to give you better performance and to reduce the weight of the board. If you go with a rotomolded board, then it will be hollow as a result of the manufacturing process. Keep reading to learn about the different materials that you will encounter when inspecting new SUPs for purchase. Fiberglass and epoxy over EPS foam: This is the most common makeup that you will come across because it can be used for several different types of paddleboarding. The weight for thie type of board varies though because the construction techniques differ as well. For instance, you could get a sheet of wood that is under the fiberglass deck to add durability and stiffness, or an infused epoxy process could be used to make the board’s exterior extra tough. The price range for this type of SUP puts it at a mid-range cost. Plastic (rotomolded): This is one of the cheapest SUP options out there. For the money, you get an extremely durable board. Some plastic SUPs are also sit-on-top kayaks, which offers a great value for the money. The disadvantage to this board type is that they are very heavy. That being said, they do make great boards for families with kids because the board can withstand a kid dragging it across the shore without getting damaged in the process. Plastic over EPS foam: This is another great value SUP type because you get ultra durability combined with lightweight materials. That means you get a board that is easy to carry that will last you a long time. The BIC-brand boards are the biggest brand out there that focuses on this type of SUP. 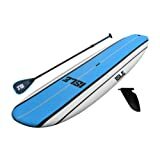 Softtops: Beginners who are worried about falling on the SUP will find this board type to be a great option. You get a SUP with a super tough exterior where the decks are fully covered with a rubber traction pad. This means that you can easily walk both ends of the board or have your dog with you on the board. In terms of cost, this is a very affordable board type. However, this type of SUP is rather heavy to carry. Inflatables: This is probably the cheapest type of stand up paddle board for sale. It offers versatility in terms of the type of paddleboarding that you can do. Made of PVC with drop-stitch construction, it is surprisingly durable. And, it is very lightweight. Another benefit of inflatable SUPs is that they break down for compact storage, which makes them perfect for taking on a vacation or for people who live in a small apartment or condo. The amount that you will spend on a new hobby is something that you should consider before you ever start shopping around for the necessary gear. When it comes to stand up paddle boarding, not a lot of equipment is needed, with the board being your main expense. SUPs range in price from under $500 at the cheapest stand up paddle board price all the way up to over $1,500 for the most expensive SUP for sale. It is important to remember that most of the cheaper SUPs are made of plastic, which makes them the heaviest SUPs that you can buy. Go with a more lightweight option though, and you will likely have to spend a little more. The exception to this are the inflatable SUPs. One thing to remember is that boards may be able to be used by more than one family member, especially if everyone will not be in the water at the same time. You see this working with most families where the kids take turns on the SUPs. Of course, an adjustable-length paddle will be required for board sharing. If you have been to any beach lately, then you’ve probably noticed that the water is full of people out there on stand up paddle boards. For those of you totally new to this growing water sport, you might be interested in giving it a try since it looks a bit easier than surfing. Plus, it looks likes tons of fun, right? Not to mention, you can totally use your SUP for a bit of surfing as well as flat water paddling. Before you head out on the water with a rental board or your own gear, check out some of the stand up paddle boarding tips below that will help you have a better time out on the water. 1. It’s all about face forward. It’s natural for beginners to look down at their feet instead of up at the horizon. I get it – you’re seeing that water rolling over your feet and starting to panic about falling off your board. Well guess what? For better stability you need to be looking ahead instead of down. Keep those eyes down and you’re certain to fall. By keeping your eyes on the horizon and focusing on an upright posture, you have more stability and don’t have to worry so much about falling off your SUP. 2. You need a leash for your board. Falling off your board is likely to happen from time to time, especially if you are out in some waves. And when it does, you need to be tethered to your board for safety. Why? The waves or current can move the board away from you or make it so that you have to swim quite a ways to reach it. This will get you tired quickly and possibly be a safety issue out there. Plus, if the waves are really pounding down hard, then the board will help you get back to the surface. Using the leash for your board is definitely more important than using it for your paddle. I suggest getting a paddle that floats so that you can worry about finding it after you get back on your board. 3. Develop strong core muscles for a powerful paddle stroke. When you are out there paddling on your SUP, it is important to do so from your core and not rely on your arm muscles. This way you well get a lot of power with your strokes without tiring yourself out too soon. Just know that if your core muscles are not strong, you will have to rely on your arms and you will definitely get worn out quickly. And that’s no fun. To strength up, I suggest doing some yoga planks each day. 4. Hold the paddle the right way. Though it defies logic at first, you need to hold the paddle so that the blade is sloping away from you. This ensures that you move through the water quickly and with less effort. And when you’re paddling on the left, your right hand will be on top of the grip handle. And vice versa for paddling on the right. Strokes should be made by pushing the paddle down in the water and then pulling it back toward the area of your ankle before pulling it back out of the water. Doing all this correctly from the beginning makes this entire learning process much easier and make the most of your paddling strokes. 5. Stay safe in the wind. When you’re out on your board, the wind can change at any time. And since you’re standing, your body basically acts like a sail and that means that you can drift out to areas of the water where you do not want to be. If you notice that the wind is becoming an issue for you, just get down on your SUP (with your paddle under your body) and use your hands to paddle like you would on a surfboard. This will help you stay safe when then winds turn unfavorable out there. 6. Give yourself plenty of room. When learning to SUP, it is tempting to paddle your board out to where all the other SUPers are at. Don’t do this. You need to give yourself plenty of room to paddle around and to fall without getting hurt or hurting others. Once you get the hang of SUPing, you will be able to better gauge how close you can get to other paddlers and surfers. 7. Know how to fall. You might be terrified of just the thought of it right now, but falling of your board is inevitable. Accept this fact now and learn how to fall properly so that you do not get hurt when it happens. Here’s the thing – you need to make sure that you fall away from your board because it is hard and can hurt you if you hit your head on it or the fins. Sure, if you’re using one of the inflatable stand up paddle boards, then it won’t be quite as hard but you will won’t want to hit it. Since you should be using a leash for your SUP, falling away from it will be fine because your board will be attached to you. From not holding the paddle the correct way to getting onto the board the wrong way, there are a lot of mistakes that the first time SUPer can make. Check out the video below to learn how you can avoid making these same mistakes the first time that you go out on the water with your new SUP. Want to buy your own board? Check out my review of one of my favorite iSUPs for beginners. Do you SUP? If so, you need to know about this cool new community that I’ve found that is made just for people like you. It’s called SUP Trotters and it is all about SUPing. What’s really cool about this community is that it is a great place to share your adventures with like-minded people. You can post photos and details of your sessions – whether you were doing a bit of iSUP surfing or some flat water paddling. What I really like about this site is being able to see all the awesome SUP photos that paddle boarders have taken while out on the water. And if you’re the kind of person who just like keep track of their water stats, then you will be happy to know that SUP Trotters has an app for your iOS or Android device. So, you can always check out your SUPing stats no matter where you are. And since all the other paddle boarders on SUP Trotter can share their data, you just might end finding a cool new route to take the next time you go out with your board. How much should/do paddle boards weigh? It varies based on size and if it’s inflatable or not. The inflatable SUPs weigh the least at around 30 lbs or so on average. Many are under that weight though, like the Wakooda inflatable SUP. Thanks for the informative guide and loved the photos. Paddle boarding and kite surfing are in my list of things to do. What do you think about inflatable SUP paddleboards? It’s pretty cool that seats can be added to some boards to turn them into kayaks. It’s a good option for those that love SUPs but want to sit down ‘kayak style’ every now and again. Any plans to write more posts dedicated to kayaking? I was out on the lake yesterday, and I noticed that I had a stress fracture around 3/4 of the shaft where the two-piece paddles connect. Of course, this was just a few hours in the trip. My buddy got a couple of sticks as splints and we jammed a similarly sized stick inside the tube for added support. The paddle is actually stronger than it was before, however, I believe it’s time for a replacement. I need some recommendations for a new paddle. My Kayak is 13-foot 74-pound and I’m always in the raised seat position of my predator MX. Here are a few paddles that I liked on Amazon with various price points. Please let me know if you have experience with any of them and tell me your thoughts. If you have a paddle that you think is better, tell me why.